I was adamant to wear pink this season at LFW, it's such a cool trend and it's my favourite colour without a doubt so naturally, I went on a quest to find some new pieces to wear. Day 2 was a little busier for me compared to day 1, I had a couple of collaborations during the day which meant a change of outfit was required (very fancy indeed!) I started off with a look from Primark which subsequently, I forgot to shoot as I spent Saturday rushing around from one place to the next - yes, I'm a bad blogger. I did post a photo on Instagram though so you can see that outfit on my page (@peexo). My second look of the day was for a collaboration with New Look which I was very excited about, as you know, I'm a huge fan of the brand and more often than not I'm prancing around in some of their pieces, so this felt rather fitting for fashion week. I was adamant to wear pink this season, it's such a cool trend and it's my favourite colour without a doubt. 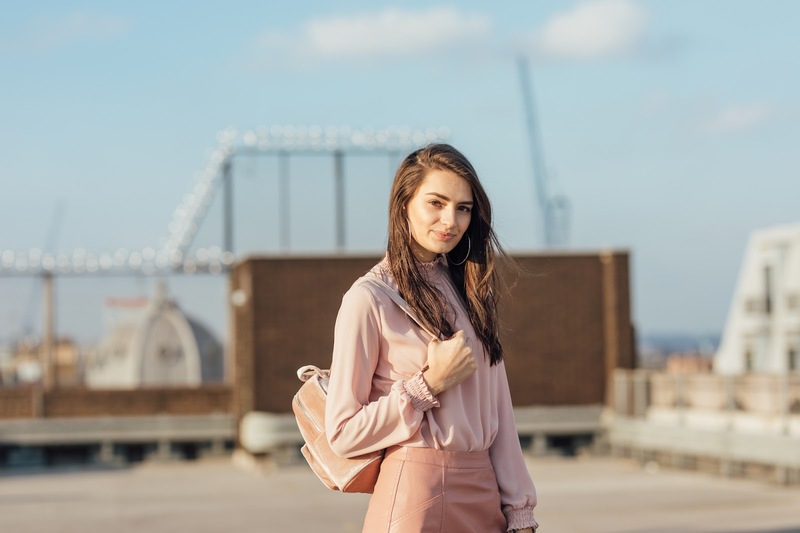 I envisioned an all pink look for fashion week and found the perfect pieces in the Oxford Street store; starting with a pretty pink top with ruffle details, a pink leather look skirt, with pockets might I add! Finished off with a velvet pink backpack (I debated whether to colour clash using the red version of this backpack but decided against it). For shoes, I chose these velvet heels which were sitting pretty in the sale isle (only £10!) and I simply couldn't resist them. Although these aren't pink, they matched perfectly with the texture of my backpack so it was a win win. Having said this, these were so hard to walk in! I love a good heel and these are the perfect block heel which in theory, should have made them easier to walk in but because of the sheer height of them they were near-enough impossible to walk in. I somehow managed 10 flights of stairs up onto the roof of this car park to get these shots which I was pretty chuffed about. So that's really it for my LFW outfit roundup this season. I also filmed what I wore for a video on my YouTube channel (peexo vlogs) and I really enjoyed trying out a new style so please do pop over for a watch and let me know what you think! This post is in collaboration with New Look. All thoughts and writing are my own, read my full disclaimer here. Loving all the pink shades! I'm nearly always in something from New Look too. Looking to add more pink to my wardrobe and I love this shade - I'll need to pop in and have a browse. Well done for managing stairs in those shoes, heels are so pretty but so painful. I picked up some velvet flats in the sales. I live in flats!